National Residence Hall Honorary recognizes outstanding students, staff, organizations and programs in residential life every month with Of-the-Month (OTM) awards. We’re going to start publishing the winners of these awards here to highlight what is so special about living in University Residences and spotlight one or more winners with a description of why that program or person deserves the recognition. The idea to put a ball pit in a public space originated from the website SoulPancake.com, created by Rainn Wilson (or Dwight Schrute from The Office). The original purpose was to allow strangers in New York to meet one another amongst all the hustle and bustle of the big city. 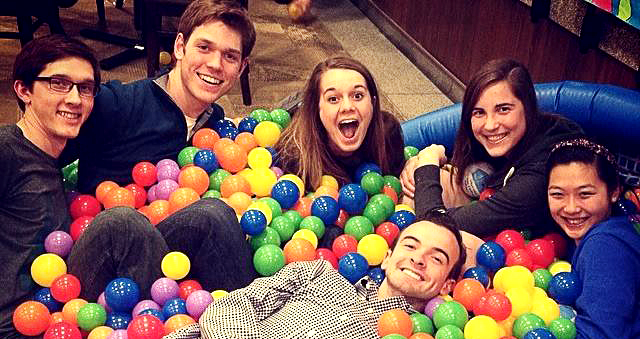 Having seen SoulPancake’s ball pit video, Shreve’s fourth floor RAs Parth Shah and Shelby Farmer felt that this underutilized piece of equipment typically found in children’s play places could be thoroughly enjoyed by college students. The Chatterbox is intended as a free space for residents of the large hall to meet each other without the usual stunted awkwardness characteristic of introductions. To aid in the get-to-know-you process, Parth and Shelby wrote conversation starters on miniature beach balls immersed in the Chatterbox, questions such as, “If you had a month to live, what would you do?” The Chatterbox is a passive program in the purest sense. Some of the RAs assembled it in the lobby one evening and left it largely unattended for a few weeks, leaving the rest up to residents. On a given day, one can walk by the Chatterbox and find two or three residents sitting and talking about life. Sometimes you might find a student lying face down in the Chatterbox after coming back from a hard day of classes. I’ve walked through the lobby to see a person sitting solitarily in the Chatterbox, only to watch as a pair of hands and a face emerged from below the surface, accompanied by laughter from all involved. Whether as a reminder of the simpler days of childhood or a vehicle for intellectual adult conversations, the Chatterbox is open to everyone. Congratulations to all of our Of-the-Month winners for February!